So my morning meeting in Shanghai went well, and we had the afternoon off to sightsee. It was pouring rain — which is my second favorite kind of weather, after "lightly overcast and drizzling" because first of all, I hate glare, and secondly, as my mama always said, "You're not made of sugar, you won't melt." Rain clears out the streets and makes everything look even more picturesque, anyway. Every city is romantic in the rain, even Harlow New Town, so Shanghai is practically the LD-50 dose of romantic when it's raining. Sadly, my traveling companions didn't feel the same way about the rain OR ecstatic at the prospect of fabric shopping, so they bailed to go work (or work out). 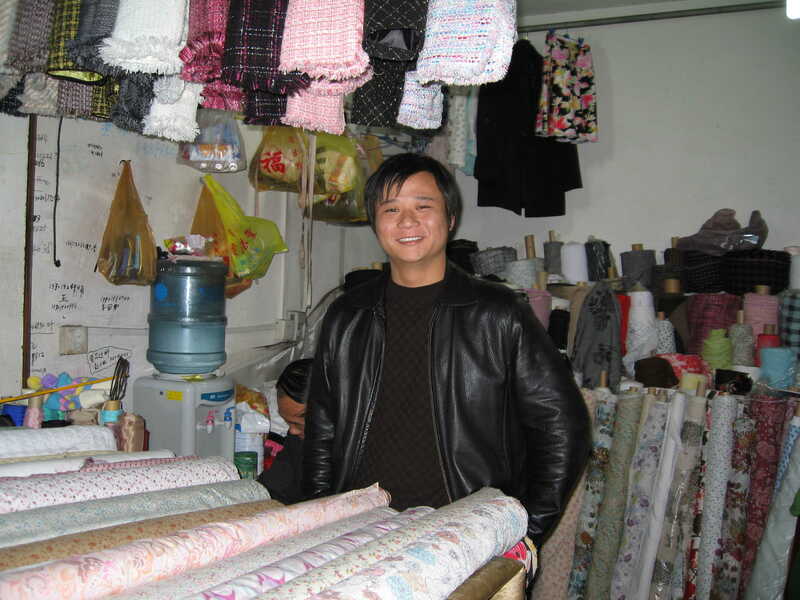 I grabbed a cab to the Shanghai Dongjiadu Lu Fabric Market, where I promptly bought sixteen meters of fabric for about $40. 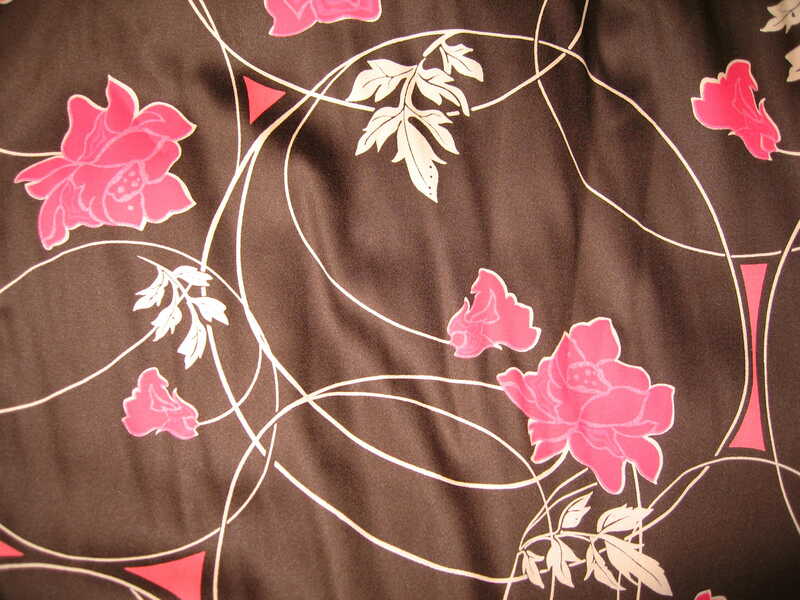 It looked like this, a nice brown, cafe-au-lait, and red print. The fabric has a nice hand, might be a cotton-silk blend, might be a cotton-rayon blend. I decided NOT to buy any silk charmeuse this time, as I hadn't sewn any of the silk I bought last September in Beijing, and because I didn't want to go home with a lot of chinoiserie that I wouldn't wear. I was looking strictly for cotton or silk/cotton prints, the wilder the better. I see this turning into a late 1930s, early-1940s-ish dress with maybe a little collar, gathering under the bust, and a quarter-circle skirt, below-knee-length. 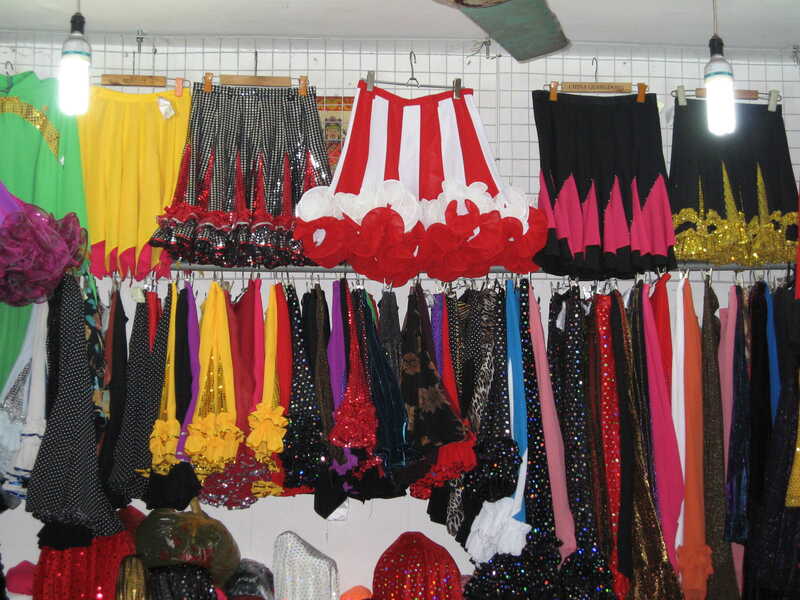 Then I passed the Stall of the Crazy Skirts, or maybe The Home of Shanghai DanceSport — not quite sure what was going on here but I was SORELY TEMPTED. Then I remembered just how little space there was in my luggage or my life for a two-tone black-and-red sequined flared and ruffled trumpet miniskirt. Sadly. 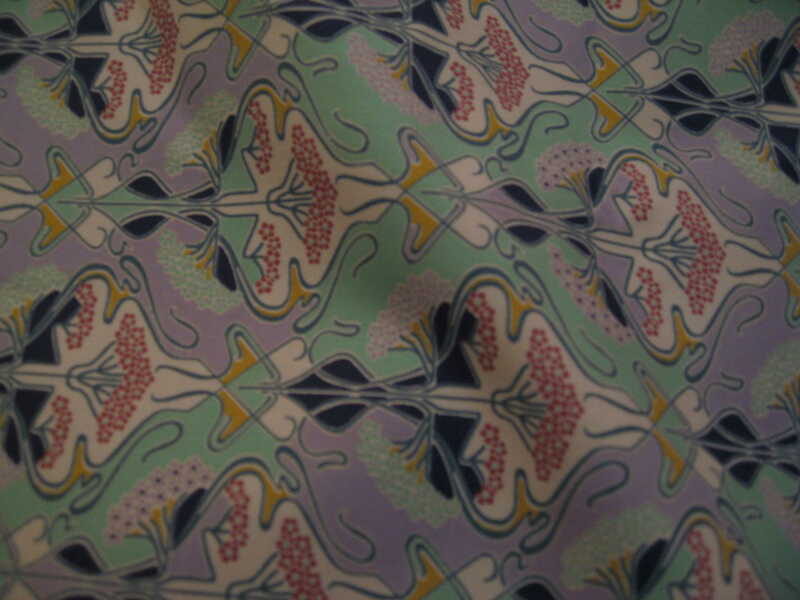 Then I bought the next piece of fabric, a beautiful kind of deco-y blue print. (This picture is especially bad.) It's a heavy twill weave; I'm pretty sure it's silk or at least silk-cotton. They had it in three colorways (blue, cream, and green), but this reminded me of the first piece of Liberty Tana Lawn I ever bought, so I chose the blue. I think it wants to be a tailored 50s dress with welted hip pockets and a vee neck. This one wants to be a hippie chick dress banded in brown. Or possibly that celery green. I think. For a while now every piece of fabric that I buy wants to be the hippie chick dress, but last summer everything wanted to be a circle skirt. Sometimes you just have to look at the fabric and say, sternly: "Listen, you know I love you, right? And that I want you to be happy? But I already have [insert astronomical number here] of that pattern made up — here's a nice stack of really pretty patterns. I'll leave you alone with them for a while and you can make up your mind, 'kay?" It's a very low-quality voile, which means it's not heavy enough for a dress (unless I pin-tuck it, said the crazy woman), but hey! Cherries! 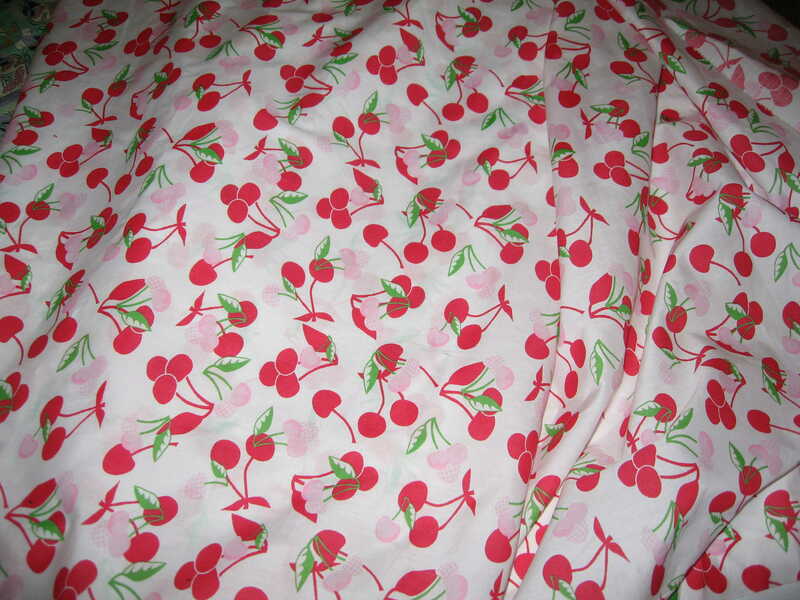 Really, really cute cherries! I bought 3.8 meters of this — all that was left of the bolt. I had lost my will to do the haggling thing by that point; the whole "look mildly interested, shake head ruefully at price, prepare to walk away, wait for next offer, make lower counteroffer, respond with more head-shaking to new price, blah blah blah" seemed crazy for a difference of, at most, two or three dollars. I barely made an effort with this fabric, so I think this was more expensive than the silk twill! I did spend a little more time there, mostly watching other westerners get measured for shirts and suits (I had brought a suit pattern on the off-chance that I'd have time to be fitted and have it made up, but decided I'd rather spend the money on fabric), but then the vendors all started packing up, in a foul mood because of the wet floors and leaky roof, so I left and walked a few more blocks in the POURING RAIN, enjoying myself immensely. Then I realized, hey, all the buildings on this particular street are completely burnt out, roofless, and uninhabited (and that would be the BEST CASE SCENARIO) and all the folks here are staring bemusedly at the western woman in the bright pink raincoat and orange tights, so maybe I should get a cab. So I did. I also took a picture of The World's Scariest Mannequin, which must have been purchased at the fire sale of the Nazi Uniform Supply Company, but I didn't upload it. Maybe later if you're all very very good. It's 5 a.m. here and I have been up for an hour–topped myself up on sleep yesterday and so the needle pointed to full a couple hours early–and thus you all suffer. Next entry will probably be me, live from Budokan, I mean Tokyo. I can just SEE the first dress you describe! Sounds beautiful! I love your description of walking in the rain.Have I told you yet that now you’ve got me sewing like crazy and hooked on fabric shopping? I also now am the proud watcher of at least 10 different vintage dress patterns on ebay, ONLY I have not yet gotten round to being patient enough with a pattern. — Yes, I have cut ups that I furiously threw in a pile after I about gave up altogether with the idea of sewing! I am determined to recreate some gorgeous dresses akin to the ones I saw in the movie The Notebook! Loved the dresses I saw in the Stepford wives too. Okay wait, do you also make matching hats and gloves to go with your dresses? I see patterns for hats but I don’t understand how they can be made, I thought some hats just had to be pressed with some kind of hat mold? (yeah I’m that clueless) And how is it that those vintage hats look cute on other people but I try a vintage one at a thrift shop and I look hideous in it? Maybe not placing it at the right angle? A hat pin might help too I suppose. Sorry I know, I’m talking a mile a minute but I’m so excited about the prospect of maybe really having a wardrobe that I secretly desire. Even if I am the only one walking around in head to toe 1940’s attire in this town, I won’t care!So thank you again for getting me into this hobby I’m having a blast! Oh I am so jealous! 16 metres of fabric. Are you FedEx-ing it home? I love your writing as much as drooling over the pictures of fabric. I must see the World’s Scariest Mannequin. I simply must. Holy crap. I’d give a million dollars to see you wear one of those red-and-white-calliope-and-gumdrop-colored skirts to the office. Just to shake up the staid chair-warmers here a little bit. But you’re back already. Dream deferred. 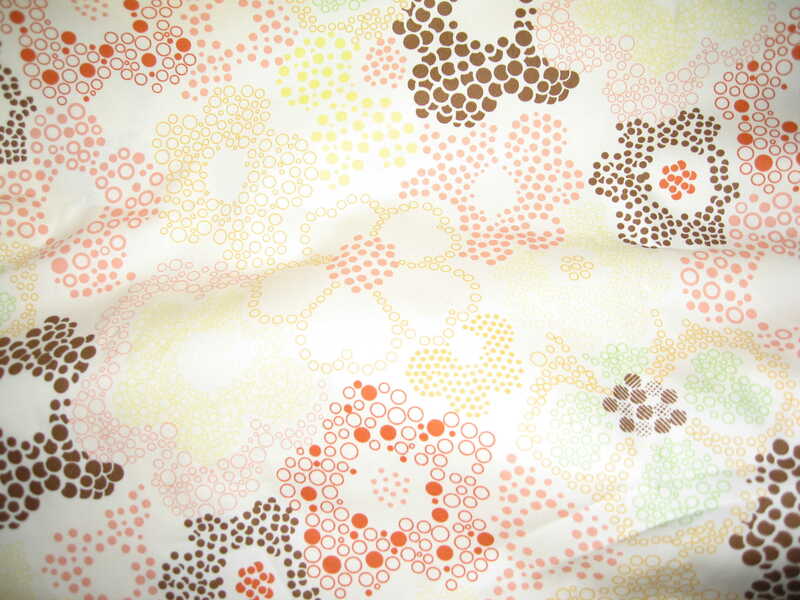 love your blog..and i just recently went to the same shanghai fabric market & went crazy! !